Characters with fluff rosters get rewarded in TB but get penalized in GA. It seems balanced. Oh look, more crap rewards. I think the rewards are quite good. I have a need for everything in the rewards, plus GA is a fun game mode anyway. I agree with both of those statements. As someone who has a decently narrow account, 2m and I have traya and revan. Grand arena has been a joke so far. 1 account from 2 full grand arenas might give me a bit of a challenge but I still haven't lost a single match up yet. 15-20m in hsr but I am absolutely garbage at TB. No one in my guild seems to say anything about it though. Is it balance comparing the two? Grand arena competency will almost 100% transfer to territory wars too so it's not just tb vs ga. I honestly don't know how they could make it better, who ever said let me not pick the ones that you aren't using to reduce fluff? I am sure that works in your head but I would just remove fluff to. Drop down to exactly only the teams I would use in the arena and that's it, than it becomes a mod battle, which is actually where I think the real deciding factor lies, not in roster or gp. As I am sure those who have recently earned Revan and realised that it doesn't just mean instant 1st place. if you don't have competitive mods you probably didn't get a big a boost as you thought. Just caught up to the outskirts of the established revans. It also screwed up my defenses, because I assumed the bottom right territory was the ship territory before deploying my squads. Pays to check each territory before rushing into anything. Yeah. I was looking at the ship territory and wondering why it had a big circle and was worth 3 more points than the territory below it. Figured it was because the top one was harder to get to. Luckily my first round opponent only has one g12 character and a handful of zetas, so my mistake on defense is not likely going to cost me this round. So Grand Arena is now 1v1 TW and just like squad and fleet arena. Its just lame. I wish EA would do something creative. 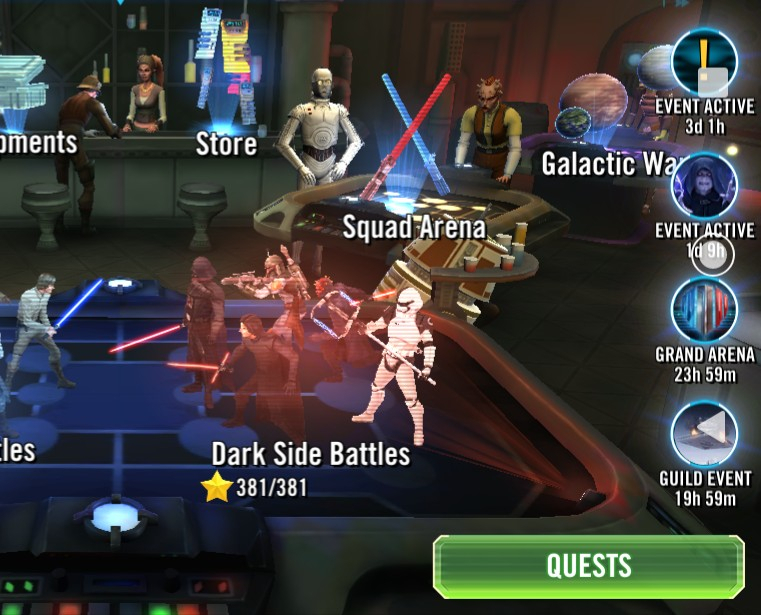 New modes of play can help those of us who don’t have highly tuned squads for SA and FA, or Revan, etc. I don’t see the point of GA now that it is just a mini TW.. I guess its for the rewards. I don’t think it does it ratio wise. I am currently #27 in fleets. Someone in my grand arena is currently #9. We both have good fleets with Hound’s Tooth. Then we have a player at rank #276, who only has one 7 star ship (Consular’s starfighter). They clearly have way more character GP than anyone else because they neglected fleets. It may seem that it does matchmaking based on both fleet gp and character gp, but that is just because most players are not dumb enough to ignore ships. But the ones that are get a leg up in arena. Luckily players like this do not have many zetas as a result of not doing ship. So I missed this round of Grand Arena. Would it be possible to throw up a notice somewhere else besides just having to click on the GA table everyday to see if there is one? How about the monthly calendar? I know it's sometimes revised, but this one has been known for a while. And I know that I sound like a broken record on this one, but if your guild uses an out of game chat app, my guild regularly talks strategies, etc... well before the signup period is over. Yeah thanks, I just missed that because there were 3 other buttons so I missed it because I didn't read the grand arena part. So much other stuff happening at once threw me off. Same - except I knew GA was happening, but saw the TW notification and thought both deployment phases lined up, so assigned no defense teams. I really wish they would run on either the same schedule or at completely different times. I have only one wish. Can you please publish photos of programmers? I will print them, nail on the wall and worship like demi-gods. Algorithm to find 8 closest numbers is imposible to build, its holy grail, but they did it. And call it “matchmaking” is simple brilliant. Thank you! I'm tired of coming up against people who don't set a defense. They just join because why wouldn't they? Free last place rewards for one button push. How about a change to the reward structure? Instead of getting first and second etc place rewards, increase the reward for clearing a territory. Add a reward for clearing all territories. Also get a reward for any defense team that took more than 1 attack to get beaten. Get rewards for playing, is what I'm saying here. Take away the reason to sign up, but not play. That way people who actually like it and enjoy playing get rewarded. This is easily the event I hate the most. It’s too boring, one or two rams and set up make all the difference, and unlike normal tb there aren’t enough other players involved to get around the potential parity of two opponents. I will lose because my opponent can beat one of my teams and I cannot beat one of his. It’s silly. It’s a nice idea but not even remotely fun in practice for 5 on 5. At least 3 on 3 forces some creative use of toons but even that’s becoming more standardized. The computer can just re-set my defenses and if I see an opening I’ll attack otherwise I don’t care anymore. Gimmie those modulators !!!!!!!!!!!! Thank you sir ! I just got my first bye and am enjoying it.